The Knit at Night Guild, www.knitatnight.org, has 6 chapters (I'm a member of the central chapter - KNIT) and each chapter meets once a month. Whenever we meet there are announcements, show & tell and usually a program where you can learn something new. I was approached last year to put on a program for my chapter and shortly after I accepted it Hurricane Harvey happened and my September date got pushed back until March. We had just gotten back into our house in February so I pushed it back again to July. So on July 10, 2018 I gave my Tunisian Crochet Workshop and I heard from everyone that it was a success. 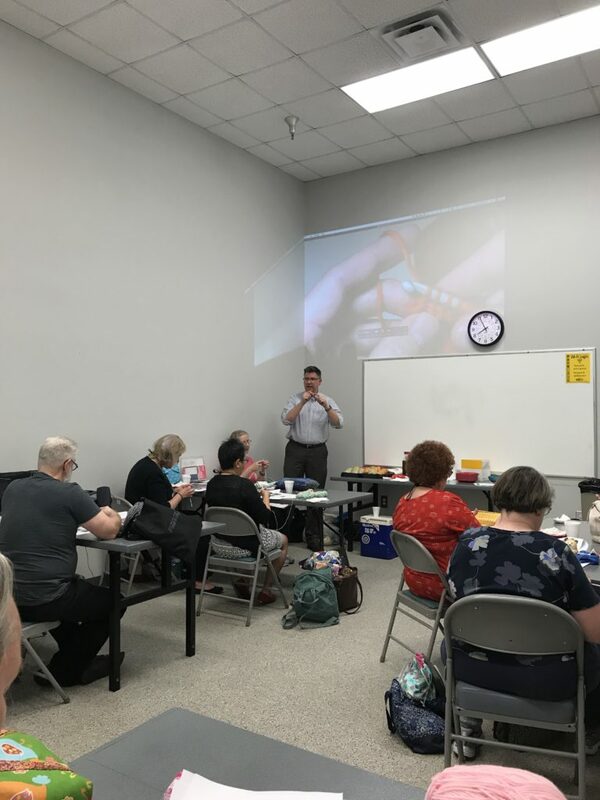 I used a projector to assist in the instruction so the hand/stitch movements could be seen easier by everyone, at the same time. The PowerPoint presentation didn't go off as planned but the raw videos worked and I agreed to put them here for everyone to learn the sample piece we created.